The road accessible, district scale (~200 sq. 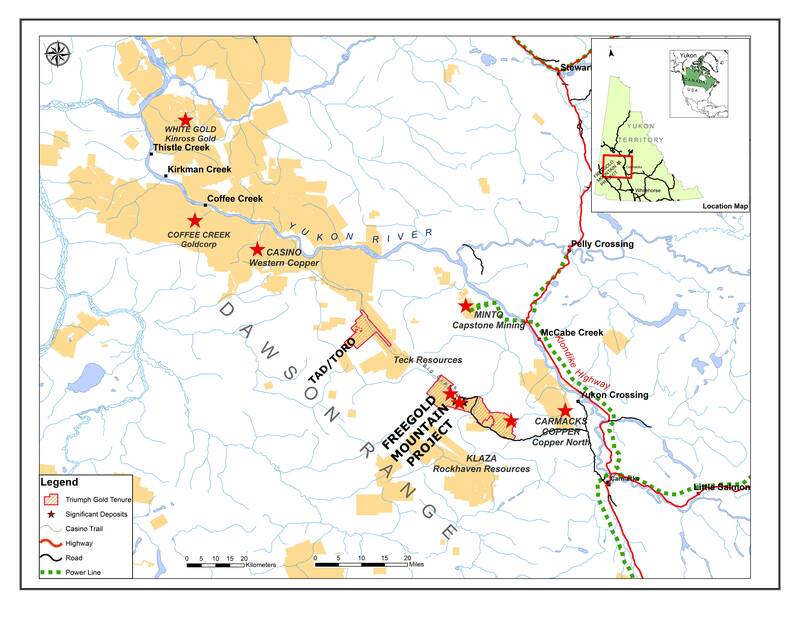 km) Freegold Mountain gold-copper project is located within the Dawson Range, approximately 70 km northwest of Carmacks, Yukon Territory, a stable, mining friendly jurisdiction in northwestern Canada. 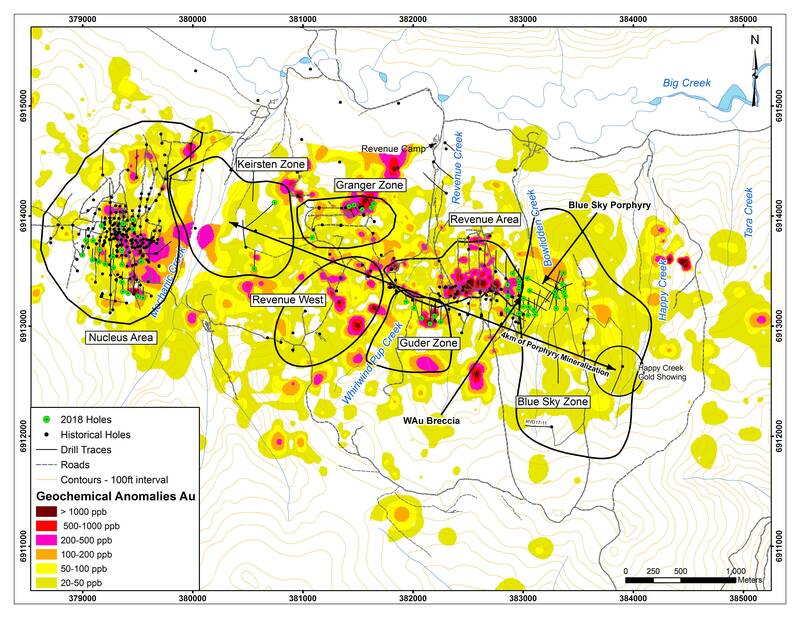 Since Triumph Gold acquired the property in 2006 more than 20 mineralized zones have been identified and NI 43-101 mineral resources have been delineated at the Revenue Au-Ag-Cu-Mo porphyry-related deposit, Nucleus Au-Ag-Cu deposit and the Tinta Hill Au-Ag-Cu-Pb-Zn vein-related deposit. The company continues to aggressively explore, building ounces at the existing deposits and evaluating the multitude of other targets located on the property. 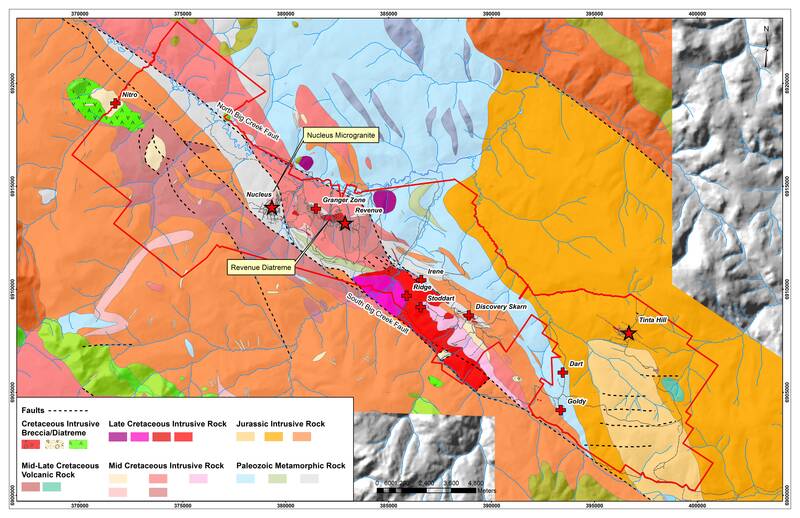 The project is situated within the Dawson Range which is also host to Goldcorp’s Coffee deposit, Western Copper and Gold’s Casino project, Copper North’s Carmack’s Copper project and Rockhaven’s Klaza deposit. Within the district, the Big Creek Fault is recognized as a controlling structure related to many of the most important deposits. Triumph Gold’s Freegold Mountain project is ideally situated within the Dawson Range along one of the only road accessible portions of the Big Creek Fault. The Freegold Mountain property is underlain by Paleozoic metamorphic schist and gneiss of the Yukon Tanana terrane, which was intruded by Jurassic, and Mid- to Late- Cretaceous granitoids. Emplacement of Cretaceous intrusions was focused along dilatational bends that link the North and South Big Creek fault strands. Multiple reactivated regional scale fault systems and emplacement of syn-tectonic intrusions resulted in an impressive metal endowment and several deposit types. The Revenue and Nucleus deposit areas are affected by two superimposed magmatic-hydrothermal events, a Middle Cretaceous porphyry event that is overprinted by Late Cretaceous emplacement of a diatreme, quartz-feldspar-porphyry dykes and related sulfide-matrix hydrothermal breccias. The property encompasses several other porphyry-style exploration targets including the Generation Zone, Stoddart, Cabin, Nitro, and Castle. Outboard of the porphyry showings there are a number of gold-rich epithermal vein showings including Irene, Ridge, Goldy and Dart, and gold rich skarn showings including Guder and Discovery. Tinta Hill is an intrusion hosted copper-gold enriched poly-metallic vein-type deposit. These showings, along with over a dozen others on the property, have been advanced to various exploration stages. Triumph Gold is committed to growing the resources at Revenue, Nucleus and Tinta, while evaluating and exploring the other showings; identifying new opportunities to increase shareholder value in the Yukon. A large program of surface and sub-surface mineral exploration was undertaken from March to early October at the Nucleus and Revenue Deposits, as well as the Blue Sky, Happy Creek (Maximus II), Drone, Kiersten, Irene and Cabin Zones. This work included 73 diamond drill holes totalling 17,532.68m, 13 excavator trenches totalling 921m, 8 channel sawed trenches totalling 209m, 865 infill soil samples, 55 rock (grab) samples, 30 line kilometres of deep penetrating IP, and 48 line kilometres of ground mag geophysics. The 2018 exploration program was mainly focused on testing a six kilometer-long intense multi-element and geophysical anomaly that surrounds the Nucleus and Revenue deposits. A geological review of the Revenue and Nucleus deposits, conducted in 2016, reviled that they are components of a larger porphyry-related mineralizing system. In 2017 Triumph Gold conducted step-out drilling in the surrounding soil and geophysical anomaly and encountered porphyry and/or epithermal mineralization in each of the four areas that were tested. Results from that program included both the highest grade gold mineralization ever intersected at Revenue (7 metres grading 15.0 g/t Au, including 1 metre grading up to 81.3 g/t Au, in RVD17-14; see news release 17-14 Nov 15, 2017, and the highest grade porphyry mineralization intersected on the entire property to date (57 metres grading 1.01 g/t Au and 0.285% Cu, in RVD17-13; see news release 17-13 November 2, 2017. The 2018 exploration program followed up on those positive results, continuing to test the areas where high grade intersections were made in 2017, and further investigating the broad soil and geophysical anomaly that encompasses and surround the areas of known mineralization. 30 line kilometres of deep penetrating IP-DC-MT and 48 line kilometres of ground mag over the Revenue-Nucleus-Blue Sky area in October of 2018, targeting a buried intrusion — results pending (see news release 18-10 September 20, 2018). Copper and Gold Equivalent [CuEq, AuEq] are used for illustrative purposes, to express the combined value of copper, gold, silver and molybdenum as a percentage of either copper or gold. No allowances have been made for recovery losses that would occur in a mining scenario. CuEq and AuEq are calculated on the basis of US$3.00 per pound of copper, US$1,250.00 per troy ounce of gold, US$16.00 per troy ounce of silver and US$16.00 per pound of molybdenum oxide. Drill interval lengths refers to drill hole intercept. True widths have not been determined. Gold equivalent (AuEq) is calculated based upon prices of US$1250/oz for gold, US$22.00/oz for silver, US$2.90/lb for copper, and US$10.00/lb for molybdenum, and assumes 100% metal recovery. All figures are rounded to reflect the relative accuracy of the estimate and numbers may not add up due to rounding. The resource estimate is categorized as Indicated and Inferred as defined by the CIM guidelines for resource reporting. Mineral resources do not demonstrate economic viability, and there is no certainty that these mineral resources will be converted into mineable reserves once economic considerations are applied. Tony Barresi, Ph.D., P. Geo., VP Exploration of Triumph Gold Corp., is the qualified person, as defined by NI 43-101, and has reviewed the technical information in this summary.